All content showing in the Focus Module is by default of the current period. You can, however, add Focus Areas to a coming period. This is good to do some time in advance so that , when the period is closing in, employees have Focus Areas to align their new OKRs with. If you are unfamiliar with Focus Areas and how to add them, learn more here: Adding a Focus Area to a coming period. In the upper right corner you find the period selector. Clicking on the right arrow takes you to the coming period. While in the coming period, make sure you are in the Focus Module by clicking on Focus in the main menu. Click the Add Focus Area button and follow the steps described in the article Getting started with Focus Areas. Click the Current period text at the top of the page and select the coming period. Add a new Focus Area, following the steps described in the article Getting started with Focus Areas. 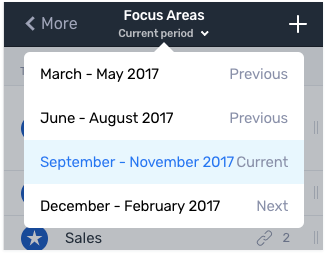 Your new Focus Area is now visible for your entire organisation and anyone within the organisation can align their coming OKRs with this Focus Area.